the museum for steam engines in the historically Engine Shed "Bahnbetriebswerk historisch" Arnstadt. The "Alteburgtower" is a popular lookout point on a high plateau above the town. In former times was in the proximity of the today's tower a barrier system. In 1901 the tower was inaugurated as the "Emperor Wilhelm Tower". 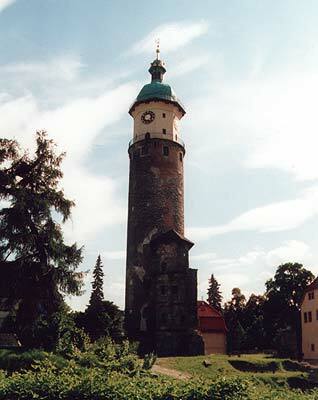 In the directly neighborhood of the tower is the restaurant "Alteburg". Unfortunately closed at present. Arnstadt is also a town of churches. There are five buildings in the town. and the "Himmelfahrtskirche" on the former "Old Cemetery". The art of beer brewing is a very old and big tradition in the town. In former times were in the town more than 120 houses with brewing right registered. The wheat beer is after the excessive quantity an invention from the Mayor Fischer of that time. Unfortunately has not one of the the traditional breweries the eventful times survived. There was a new start with the opening of the "Culture-and Town Brewery" (Stadtbrauerei Arnstadt) in the restored building of the former "Brewery Mergell AG".